Info "Beat them all down!" Beat-Down is one of Dribble and Spitz's microgames in WarioWare: Twisted! The game's purpose is to pound all the objects found. 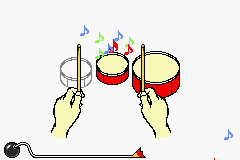 To do so, the player has to direct the hand and press the A button to pound. If done so, the game is won. If the time's up and all of the objects aren't pounded yet, the player will lose. 1st level difficulty: There will be three objects. 2nd level difficulty: There will be four objects. 3rd level difficulty: There will be five objects. This page was last edited on September 19, 2018, at 21:38.